Choice of subjects for illustration focuses upon the spectacular events of Richard's life, optimising the grandeur of his life. 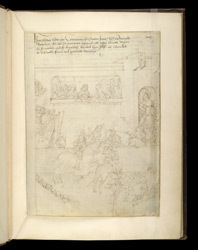 Here he jousts at the coronation ceremony of Joan of Navarre (2nd wife of Henry IV) in 1385. The space and figures in it radiate around Richard, his helmet sporting the Warwick emblem, a bear with ragged staff. Above, the queen points to him, her gesture echoed by the man to the left who selects the strongest lance. Around the lower edges of the picture, squires and servants prepare more lances. The pictures were probably drawn first because the captions always avoid the picture.